The first gathering outside Europe of the Visegrad group was supposed to be a crowning achievement for Netanyahu in his outreach to central and eastern Europe. But it dramatically unraveled over a bitter exchange between Poland and Israel over how to characterize Polish behavior toward its Jewish community during and after World War II. 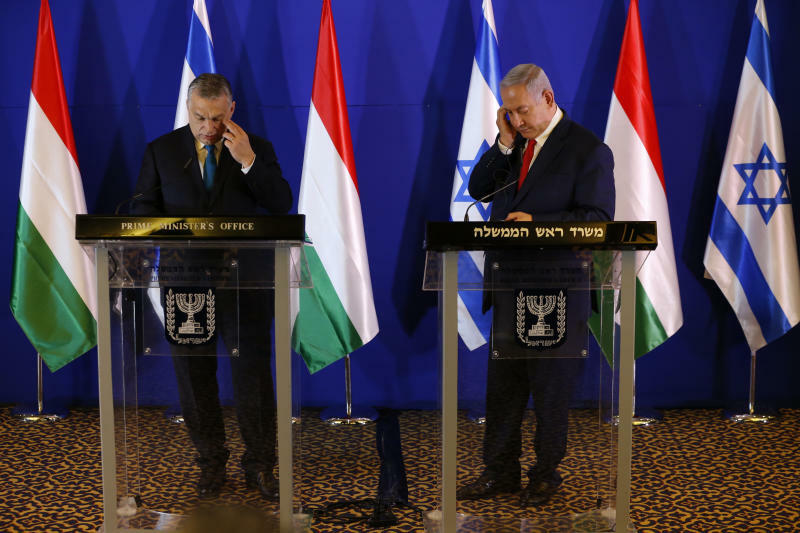 In place of the summit, Netanyahu held back-to-back meetings with Slovak Prime Minister Peter Pellegrini, Czech Prime Minister Andrej Babis and Hungarian Prime Minister Viktor Orban before hosting all three for lunch at his official residence. Netanyahu has courted these emerging democracies to counter the criticism Israel faces internationally, including from western European allies, over its policies toward the Palestinians. In what Netanyahu called "a very important achievement," all three countries announced plans to open diplomatic offices in Jerusalem — a step seen by Israel as solidifying its claim to the contested city. But hovering over it all was the absence of Poland, the fourth member of the group. In brief comments alongside the three visiting leaders, Netanyahu made no mention of the elephant in the room, focusing instead on a range of joint economic, technological and cultural projects. Hungarian Prime Minister Viktor Orban, another leader who has trod into the sensitive terrain of World War II conduct, was the only one to address the diplomatic crisis. He said he hoped the countries could resolve their dispute and "improve the situation." "It's always better together with them than without them," he said of Poland. The fallout between Israel and Poland, typically close allies, began last week when Netanyahu, pressed by reporters accompanying his visit to Warsaw, acknowledged that "Poles cooperated with the Nazis." Netanyahu later sought to clarify that he "spoke of Poles and not the Polish people or the country of Poland," but the comments infuriated his Polish hosts, who reject suggestions that their country collaborated with the Nazis and have passed a law that prohibits linking the Polish nation to the genocide of 6 million Jews. Poland's Prime Minister Mateusz Morawiecki announced Sunday that he was pulling out of the summit and canceled Polish participation altogether the following day after Israel's acting foreign minister, Israel Katz, referenced a quote from the late former Prime Minister Yitzhak Shamir, who said that Poles "suckled anti-Semitism with their mothers' milk." Morawiecki denounced the comments as "racist" and "absolutely unacceptable." Poland's nationalist government has been quick to denounce anyone accused of linking the country to the well-documented history of anti-Semitism and violence against Jews that took place there during and after the wartime German occupation. Israeli officials see Poland's controversial legislation as an attempt to suppress such discussion, and Netanyahu has faced criticism from historians in Israel for not opposing the law, which critics say distorts history. Netanyahu has also come under fire for seemingly catering to the leaders of Lithuania, Ukraine and other countries who have engaged in selective World War II-era commemorations that play down their countries' culpability while making heroes out of anti-Soviet nationalists involved in the mass killing of Jews. Orban, a close Netanyahu ally, has lavished praise on Miklos Horthy, Hungary's World War II-era ruler, who introduced anti-Semitic laws and collaborated with the Nazis. Orban also has backed a state-funded museum that experts say plays down the role of Hungarian collaborators. He also used anti-Semitic tropes against the liberal American-Hungarian billionaire George Soros during his re-election campaign. 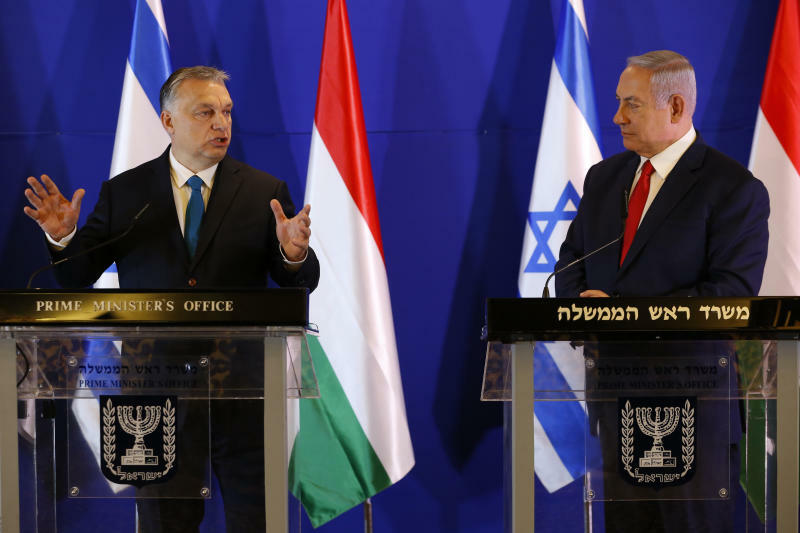 In his meeting with Netanyahu, Orban condemned resurgent anti-Semitism, saying that Hungary strives to battle anti-Semitism in Europe and support its own Jewish community. Looking ahead to this year's vote for the European parliament, he said Hungary hopes for an outcome that "helps us push back the anti-Semitism in Europe." 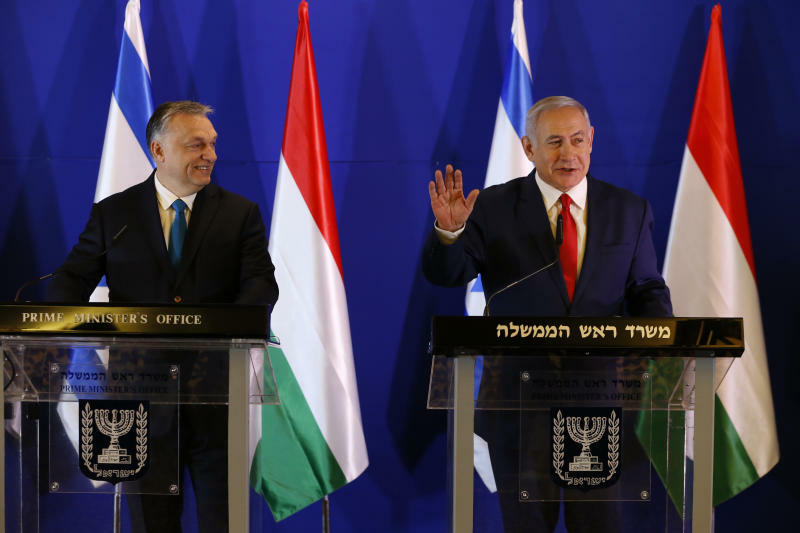 Netanyahu, who has been criticized at home for his friendship with Orban, emphasized the "tragedies that afflicted the Jewish people on Hungarian soil" in his remarks to the Hungarian leader. Standing alongside Netanyahu, Slovak Prime Minister Peter Pellegrini noted with pride that more than 600 of his countrymen had been recognized by Israel's Yad Vashem Holocaust memorial for saving Jews during World War II. He claimed the figure marked the highest per capita proportion of any country. Yad Vashem would not confirm the claim, but said any "statistical conclusions" about a country's Righteous Among the Nations "should be avoided." The Slovak Republic was a client state of Germany in World War II whose leader, Jozef Tiso, collaborated with Hitler and deported Jews to Nazi death camps. "The government did everything possible to round up all the Jews and send them to Auschwitz and Majdanek. There were a high percentage of victims in Slovakia," said Efraim Zuroff, the chief Nazi-hunter of the Simon Wiesenthal Center. "Many people there idolize Tiso to this day." It's a sensitive subject for Poland — where these concentration camps were located — but which for centuries before was a vibrant center of Jewish life. Poland was the first country occupied by Adolf Hitler's regime and never had a collaborationist government. Members of Poland's resistance and government-in-exile struggled to warn the world about the mass killing of Jews, and thousands of Poles risked their lives to help Jews. Netanyahu is seeking re-election in April, and it is possible both he and Katz are trying to gain favor with their nationalist base by standing up to Poland. Likewise, Poland's leaders are preparing for both national and European elections this year. The saga has been linked to a new wave of anti-Semitic incidents in Poland, where the local Jewish leadership has called on all sides to tone it down.